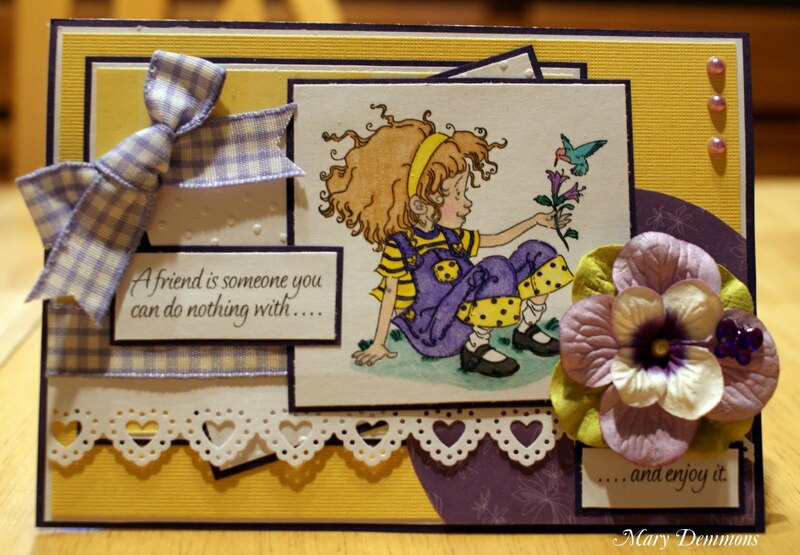 Mary's Crafting Corner: A Friend is. . . I created my card using the colors yellow, white and purple for the color challenge at The Corrosive Challenge and for the retro challenge at Bronte and Bella's (Mo's) Challenge. The purple is dark and might look a little black but trust me it is purple. The sketch that I used is from the chalelnge at The Sweet Stop. I embossed the square of white cardstock behind the image using a cuttlebug embossing folder (dots) and then backed it in purple. I punched a strip of white cardstock using a lace heart border punch from Martha Stewart Crafts and added a purple and white plaid ribbon to the top of it and added it behind the image. I added a bow to the top left corner of the embossed square made out of the same ribbon. I added three paper flowers, layered to make one flower. I stared with a green flower for the leaves, then a light purple flower and finished it off with a white flower with a dark purple center. I added a light yellow pearl to the center and a purple butterfly gem to one of the petals. I finished off my card by added 3 light purple pearls to the top right corner. The challenge at The Shabby Tea Room is to use 11 elements. I used the following 11 elements to my card: cardstock, patterned paper, butterfly gem, punched border, embossing, ribbon, image, bow, sentiment, flowers & pearls. The sentiment on my card celebrates friendship. It says, "A friend is someone you can do nothing with....and enjoy it." This is for the challenges at Crazy 4 Challenges (celebrate something), Sentimental Sundays (Celebrate Friendship), Die Cut Dreams (Quote). such a cute image, love all the layers, adorable card! Thanks for joining us at Flutter By Wednesday! This is such a beautiful card, I love your sentiment, spoken from the heart. Thanks for joining us this time at Sentimental Sundays. Adorable card! I am one of Mo's followers and haven't had the opportunity to use it yet. Thank you for some wonderful inspiration. Such a darling image, and your card is lovely! Thanks so much for joining us for this week’s Sentimental Sundays! Love this!! super pretty card! Thanks for playing along with my flutter by challenge! Oh Mary...how adorable!! I laughed when I read about Becca and her dress shoes...I have a couple of granddaughters who do the same thing!! Your coloring is beautiful...love the rich colors and layers you used...and that flower perfectly sets off this darling little sweetheart!! Thanks so much for joining us at Mo's for this week's "retro" challenge! Oh Mary she is just adorable. That bow is just perfect on this card. What a gorgeous card! Love the image, you colored it beautifully and love all the detail. Thank you so much for playing along at stamp something this week, hope you'll join us again next week! This is so sweet. I love that it reminds you of your daughter.. You did a great job. Thanks so much for joining us at Mo's this week. Great job! Thanks for joining us at SSCC and hope to see you again soon. Beautiful creation! Thanks for joining us at Sunday's with Crissy!